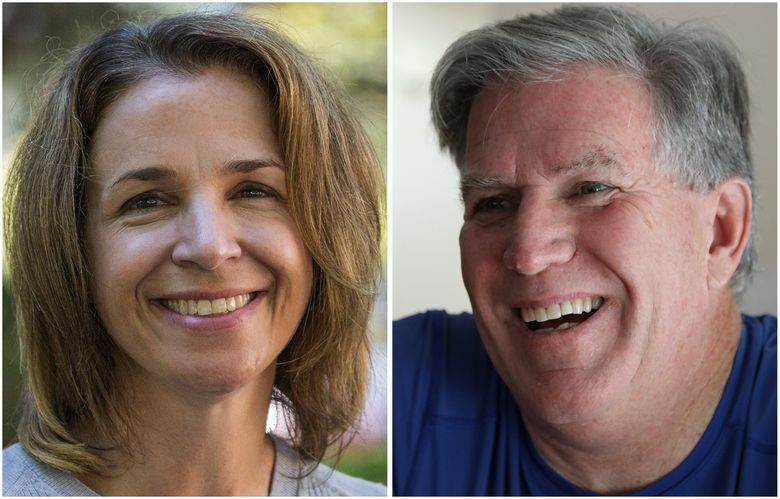 Steve McLaughlin and Hilary Franz face off across a sharp political divide as voters decide who will set policy for more than 5.6 million acres of public lands and waters in Washington, including state forests, tidelands, and natural areas. Hilary Franz is a favorite of Seattle environmentalists, backed in her campaign for commissioner of public lands by one of the founders of Earth Day and a director of Patagonia. Steve McLaughlin, her opponent, comes from a ranching background and is retired from a 25-year career in the miliary. The two are vying on the November ballot to become the next commissioner of public lands, who as leader of the Department of Natural Resources is the state’s top firefighting official and manages 5.6 million acres of state lands. The commissioner oversees logging in state forests and the leasing of state agricultural, aquatic and commercial lands that generate on average more than $200 million a year, primarily for public-school construction. The single biggest donor to McLaughlin’s campaign is the Okanogan County GOP at $2,500. His other largest contributors include timber interests, more county Republican Party chapters, the Farm Bureau and the Diamond M Ranch at the center of the Profanity Peak Pack wolf controversy. The ranch has twice asked the Washington Department of Fish and Wildlife to exterminate wolf packs attacking its cattle. Franz’s largest contributor is the state Democratic Party, at $15,000. Other top contributors include environmental philanthropists and attorneys, the Washington Indian Gaming Association’s political-action committee (PAC), the teachers union and state-employee union PACs, and Washington Conservation Voters political fund. She has vowed not to take money from timber, mining or coal interests the DNR regulates. All told, Franz reported $286,190 in campaign contributions as of Oct. 6, state records show. Donors have given an additional $172,000 to an independent effort supporting her campaign. “You don’t change the old-boy network with an old boy; you do it with a new woman,” said Peter Goldman, an attorney with the Washington Forest Law Center who has sparred with retiring incumbent Peter Goldmark and filed suits against DNR over everything from preservation of native species to DNR policy on logging on unstable slopes. Goldman gave $106,000 to the independent campaign supporting Franz. McLaughlin, 60, has raised more than $102,000 in campaign contributions as of Oct. 6, state Public Disclosure Commission reports show. The candidates’ policy differences are as sharp as you might expect. He supports Trump, despite the lewd video released Friday, which he said angered him, but was a “distraction.” She’s for Clinton. She has no doubt climate change is human- caused; he believes humans contribute to climate change — but isn’t sure how much. Franz wants to diversify funding for school construction beyond timber sales, Washington’s formula for a portion of school funding for generations. McLaughlin thinks more timber could be cut to generate more money for schools. Between them, Franz and McLaughlinhave little or noexperience in elected office. Franz was a one-term City Council member on Bainbridge Island; McLaughlin, a retired naval officer and incident command instructor, has never held public office. Franz, 46, came out on top of a field of seven Democrats in the August primary after Goldmark announced he would not run again. McLaughlin was the only GOP candidate in the race. A lawyer and a graduate of Smith College, she has been endorsed by many political leaders, including two former governors and the incumbent, a former King County executive and current office holder, many major environmental and conservation groups, unions, the state attorney general, U.S. Sen. Patty Murray, and state fire- fighting organizations. Franz resigned from her job as executive director at Futurewise to campaign full time. Futurewise is a statewide nonprofit that defends and helps implement the state’s landmark Growth Management Act. Her character was shaped, she said, by years of competitive ice skating. She’d get up at 3 a.m. each day to train for hours before school, honing a fierce self-discipline. All the falls taught her a key lesson: “Life is about you are going to fall down, and you are going to get back up again, and keep working at it until you get it right,” she said. In her job at Futurewise, she crisscrossed nearly three-quarters of the counties of the state — by her count — to help local officials and communities implement plans and regulations to preserve farmland, shorelines and landscapes, and throttle sprawl, she said. McLaughlin, who lives in Seabeck, near the Hood Canal, has a square-cut bearing from years of military training. His endorsements include the Mainstream Republicans of Washington, former Washington Attorney General Rob McKenna and the Association of Washington Business. A group called the Coalition of Western States (COWS) listed McLaughlin as veterans coordinator in a Dec. 11, 2015 news release that defends Oregon rancher Dwight Hammond Jr. and his son, Steven, whose incarceration for arson triggered the occupation last winter of a wildlife refuge near Burns, Ore. COWS accused federal agencies of a “war on rural America” and said it is working to end “bureaucratic terrorism” and “regulatory theft” by the federal Bureau of Land Management and the U.S. Forest Service. McLaughlin issued an eight-page memo seeking in part to explain his involvement with COWS and his position on the occupation by armed protesters of the Malheur National Wildlife Refuge. The Hammonds served time in federal prison on an arson charge after setting fires that burned federal lands. But they were jailed again after a federal appeals court said their sentences were too short. “That’s double jeopardy,” said McLaughlin, who added he supports the Hammond family. He was sensitized to their situation after meeting people hurt by back burns set by public agencies, including DNR, during the state’s historic fire season in 2015: “I was heartsick about that,” McLaughlin said. But he did not support the Malheur occupation. “I disagreed with the occupation because it is outside the rule of law,” McLaughlin said. He said he had no further involvement with COWS beyond the news release. He also downplayed his appearance last June as a featured speaker at the God and Country celebration in Marble, Stevens County, where, among other things, children were taught how to strip and reassemble an AR-15 rifle and field dress wounds. “Be here or risk being trapped on the same old political plantation we’ve allowed to displace our Christian Constitutional Republic!” the program for the event reads. As the leader of DNR, McLaughlin said he would improve forest health and reinvigorate the state’s response to forest fires, including beefing up initial attack on wildfires. He also wants to inspire the staff from the lowest offices to the highest to embrace public service and excel in their work. That is one of the few points on which both candidates agree. Growing up watching her father work in government service, Franz said she is imbued with a deep respect for people who do the public’s work. Both also agree state forests need thinning and prescribed burns to improve fire resilience. But they differ on wringing money out of the state’s forests. McLaughlin said his primary role as commissioner is to distribute funds from timber harvests to the school trusts. State lands, if properly managed, could take more logging, he said. Franz says the No. 1 duty of the state is to provide a quality education for its children, and she wants to see a diversification of funding sources for public-school construction, beyond logging, to ensure a reliable flow of money. “DNR needs to be a part of the school-funding solution,” Franz said. “But we need to recognize, given climate change, wildfires, drought and disease, timber may not be a long-term, year-after-year dependable source.